Any biographical information, job or military experiences or special events submitted to the Site Administrator will be posted on this page. After 27+ years in the Air Force and now 15+ years with L-3 Communications, I retired the end of last October. 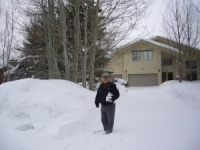 Lani and I will continue to live in Park City, Utah and would love to have you come on out for a visit. Billy J Boles and friends are coming the middle of Feb to enjoy our great snow - banner year! I retired from the navy reserves after 23 years; did 4 yrs active 67-71 . I was in Pensacola for flight training with Bill Blair. He went A-6's to Vietnam and I got P-3 anti-submarine warfare in the Atlantic. Stayed in the reserves flying out of patux. river Md , South Weymouth Mass, New Orleans, and a bit of west coast. Made 0-5 but couldn't pull 0-6 cause broken service to fly in the middle east for 2 years for Saudia 77-79. Turned 60 2yrs ago so had to retire from Southwest Airlines after 25 years. Did some land surveying, took 5000 aerial pics for the Gov., then started pounding nails as a framer for a small local construction crew a year ago. I also play a lot of bluegrass bass fiddle ( and sing!) Hey, when is our next reunion? - Went to CIC and NTDS schools before being stationed on the USS Forrestal (CVA-59). We spent most of our time in the Med. - I was on the ship for over two years and was qualified OOD and Surface Warfare Office. - After active duty, I spent 22 years in the Navy Reserve and retired as a Commander. - And at age 60 I started getting Navy retirement pay along with medical benefits (thought it would never happen). Outside of Wayne Lanier and Bill Thigpen, I am not aware of anyone else lost in service. One interesting note about my younger brother, Tom. When he was in high school he would visit me at State at the old and new house and enjoyed meeting Mike Clark since Tom was a star football player at Elkin. Tom graduated with a Masters from State in ME in 1980. He went on to West Point, made a career out of the Army, and he is now a three star (LTG) General. He spent a year in Iraq (2005) as second in command under Casey. During his tour he was on Fox and CNN quite frequently. At the 100 year Reunion last year, I saw Artie Jarvis for the first time in many years and he was in the Navy flying P3s. Bill Blair was a great friend who literally “lit up” a room . . . gregarious, outgoing, and always in high spirits. He was a party animal and yet a fairly good student. Bill had an engaging childlike naiveté as if every day or event was like opening presents on Christmas morning. Physical coordination was not necessarily one of Bill’s many assets. In the late sixties, I was Operations Officer for a squadron of eight destroyers in the Gulf of Tonkin. My Captain, an ex-Navy Seal in the Korean conflict, always wanted to know personally what was going on. As a result, he would send me in-country to various Army and Marine units. Neither were very enthusiastic with me arriving in Navy “tans” and a bright red ball cap with gold letters since such a display usually drew fire. My Captain would also send me over to other ships via helicopter. On one occasion, he sent me to a carrier . . . can’t remember which but could have been anything from the Lexington to the JFK. We were “plane guarding” which meant we had to stay in the carrier’s wake about two thousand yards astern to pick up any pilots that miss the landing and have to ditch. Trying to follow a nuclear fast carrier in a WWII destroyer without getting run over in the middle of the night is not for the faint-of-heart . . . but not nearly as difficult as a pilot who may have to punch out into the darkness of the Tonkin Gulf alone. As I was working my way down the passageway toward CIC (Combat Information Center) I saw a “flock” of pilots coming the other way. The lead swashbuckling “Tom Cruise” dropped his helmet, which rolled toward me. I thought what a spastic . . . can’t even hold on to his helmet. How can the Navy let him have a $20 million plane? That pilot was Bill Blair and we enjoyed a short visit to catch up. He may not hold on to his gear, but apparently was one super pilot.